A responsive video gallery of Inferno game films. Kim Shaw #2 to Dominique Jacobs #25- Smooth Touchdown! TB Inferno vs Orlando Anarchy. Triple Threat: Interception, Return & Goal! #16 Patrice Collie fires up the Inferno team! Running & Kicking, #8 Candace Pistole Has the Moves. Watch #9 Sheylia Rutland Dominate on the Field. TB Inferno vs Boston Renegades. TB Inferno wins over the Dixie Blues. Welcome to the 2017 Inferno Season! We have the foundation. The expectations have been set. Join us for an amazing season! Playoff Game 1: Inferno v Miami 27-6. TB Inferno wins over the Orlando Anarchy 52-3. TB Inferno wins over North Florida Pumas 70-0. TB Inferno wins over Miami Fury 24-21. TB Inferno wins over Jacksonville Dixie Blues 38-13. Orlando Anarchy Pulse victims honored at Inferno football game. 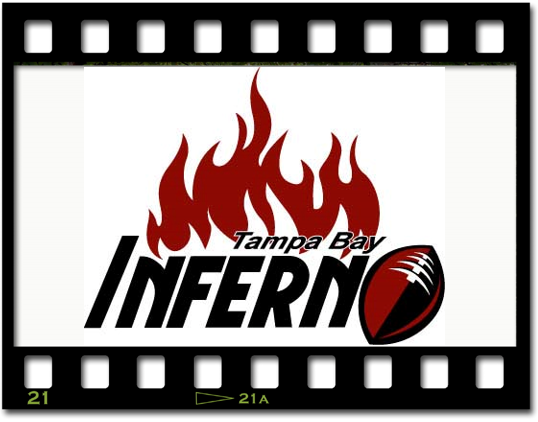 The Tampa Bay Inferno Women's Professional Tackle Football Team by Forrest Cananday.